When the Pens season ended in a spectacular disaster, swept by the Bruins, many observers – myself included – believed this would be the summer of big change in Pittsburgh. As we head towards the draft, however, it is becoming clear that this is looking less and less like a summer of change for the Penguins and more and more like a summer of complacency. Instead of relieving Dan Bylsma of his head coaching duties after their playoff embarrassment, Ray Shero and the Pens ownership gave Bylsma an extension. This should have been our first, and most clear signal, that while changes would inevitably be made, Shero did not believe that wholesale changes were necessary. In addition to locking up Bylsma, the Penguins locked up Evgeni Malkin to a long-term deal. The Pens have also opened up negotiations with unrestricted free agents Pascal Dupuis and Matt Cooke. Reports are that the conversations have progressed well enough that they are talking money. 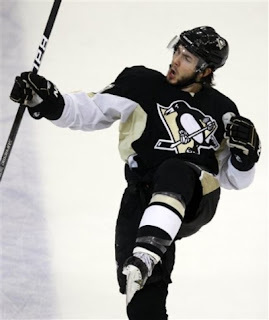 In addition to extending Bylsma, locking in Malkin long-term and getting closer to deals with Dupuis and Cooke, Shero and company also tendered qualifying offers to restricted free agents Tyler Kennedy (I may be the only Pens fan happy about this) and Dustin Jeffrey. Not only did have they dealt with the coach, UFAs and RFAs in short order – the Pens also made it crystal clear that Marc-Andre Fleury would return and would be the number 1 goalie next year. This doesn’t mean that there won’t be change – most of the pieces picked up by Shero before the trading deadline last year (with the exception of Jussi Jokinen) are unlikely to be back. In the case of Morrow I am not sure the interest is there on either side, and with Murray and Iginla, I think the economics of the lower salary cap (coupled with Shero’s efforts to retain Dupuis, Cooke, etc) make a return by either highly unlikely. When you look at the Penguins team that took to the ice at the beginning of this past season, it appears that most of the parts from that team will be back next year. The big question mark, and really the only likely big change for the Pens this offseason, revolves around defenseman Kris Letang. While Shero has moved forward with talks with both Cooke and Dupuis agents, the negotiations with Letang have progressed more slowly. After an initial meeting with Letang’s agent, a meeting at which no dollar figures were presented, there has been no additional meetings between the two sides. With the NHL draft looming and the memory of Shero’s draft day deal of Jordan Staal to Carolina fresh in our memory, it is hard not to see that day as D-day for Kris Letang. No matter what happens with Letang, the summer of big change in Pittsburgh seems to have become the summer of complacency. Is this a good thing for the Pens? Only time will tell. There are those who point out that this team came one series away from the Stanley Cup finals and that big changes aren’t necessary. There are those who point out that despite a roster laden with future of famers, this team – once again – couldn’t get back to the finals. Both sides make strong points. What I believe is clear is that if the Pens do not bring Lord Stanley’s Cup back to Pittsburgh after next season, then the summer of complacency will be followed by the summer of cataclysmic change.